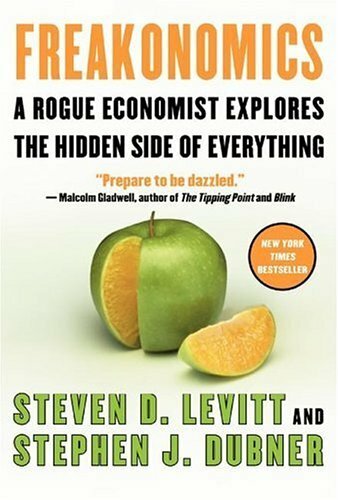 Another book I read while sick last week was Freakonomics by economist Steven D. Levitt and journalist Stephen J. Dubner. I read this basically in one evening (with maybe ten pages leftover for the next day). I have had this on my to-read list for a long time, and picked it up for just a couple bucks at the Half-Price Books Labor Day sale last weekend. I like occasionally listening to the podcast on my walks to work. I had watched the 2010 documentary a few months ago on Netflix, so I already knew most of what is covered in Freakonomics. I enjoyed the book for its entertainment value, which is strong—lots of food for thought. It does incite curiosity and interest in finding obscure connections in our everyday society. But It just felt a little bit ADD to me. Because of the authors’ casual nature in conveying arguments through statistics and numbers, I tried to read with a grain of salt. Great little quick read but not to be taken too seriously, in my opinion. Light nerd-brain candy. I would probably read the sequel, SuperFreakonomics, if it came my way for free or cheap. Read from September 6 to 7, 2012. This entry was posted in books and tagged economics, non-fiction, scientific research, society by kristin @ my little heart melodies. Bookmark the permalink.